Beach Themed Favors for your special day. A perfect favor for your special day. 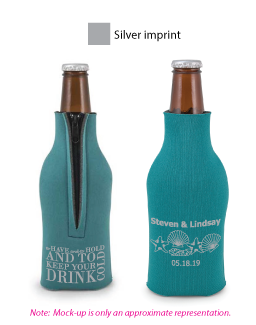 These neoprene zipper up bottle coolie can be customized to fit your colors and theme. So many compliments will follow when they see these beautiful neoprene zipper bottle coolies. Steven and Lindsay have chosen a beach theme clip art and completed their personalization with names and wedding date. Your guests will delight long after your special day, drinking their cold beverages with dry hands and high style. Our neoprene zipper bottle coolies start as low as $1.49 per item and have 35 assorted colors to choose from. In addition our prices include customized design and shipping within the continental US. Don’t miss out on these a real customer favorite!